Sinningia Tubers - Sinningia sp. "Desafinado"
This tuber has an inverted-cone top. It is quite unlike the "bagel" tuber of S. polyantha (aka sp. "Waechter"), or the flattened dome tuber of S. douglasii, with which it has been compared. Here is a tuber which is best planted only half submerged in the soil. The inverted-cone tuber is quite attractive. 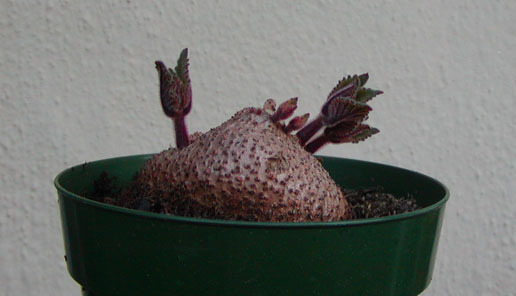 See also another picture of a sprouting tuber of this variety.